As mechanical systems become more complex so do the mathematical models and simulations used to describe the interactions of their parts. One area of multibody theory that has received a great deal of attention in recent years is the dynamics of multiple contact situations occurring in continuous joints and couplings. Despite the rapid gains in our understanding of what occurs when continuous joints and couplings interact, until now there were no books devoted exclusively to this intriguing phenomenon. 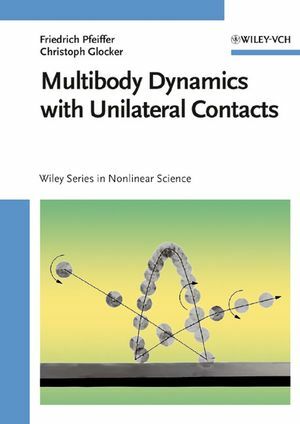 Focusing on the concerns of practicing engineers, Multibody Dynamics with Unilateral Contacts presents all theoretical and applied aspects of this subject relevant to a practical understanding of multiple unilateral contact situations in multibody mechanical systems. In Part 1, Professor Pfeiffer and Dr. Glocker provide an exhaustive review of the laws and principles governing the dynamics of unilateral contacts in multibody mechanical and technical systems. Among the topics covered are multibody and contact kinematics, the dynamics of rigid body systems, multiple contact configurations, detachment and stick-slip transitions, frictionless impacts, impacts with friction, and the Corner law of contact dynamics. In Part 2, the authors present numerous applications of the theories presented in Part 1. Each chapter in this part is devoted to a different law, theory, or model, such as discontinuous force laws, classical impact theory, Coulomb's friction law, and mechanical and mathematical models of impacts and friction. In addition, each chapter features several practical examples that allow engineers to observe the concepts described in action. Examples are drawn from a broad array of fields and range from hammering in gears as occurring in a synchronous generator to impacts and friction as observed in a child's woodpecker toy, from a demonstration of classical impact theory using an automobile gear box example, to Coulomb's friction law as applied to a turbine blade damper. Multibody Dynamics with Unilateral Contacts is an indispensable resource for mechanical engineers working on all types of multibody systems and the friction and vibration problems that can occur in them. It is also a valuable reference for researchers studying nonlinear dynamics. The only book devoted entirely to the theory and applications of onE of the most crucial aspects of multibody system design. * Provides a comprehensive examination of the laws and principles governing the dynamics of unilateral contacts in multibody mechanical and technical systems. * Presents the latest mathematical models and simulation techniques for describing the interactions of joints and couplings in multibody systems. * Describes practical applications for all the concepts covered. * Includes numerous examples drawn from a wide range of fascinating and enlightening real-world demonstrations, including everything from an airplane's landing gear to a child's toy. FRIEDRICH PFEIFFER, Dr.-Ing., is Professor of Mechanics at Technische Universität München. Prior to joining the university in 1982, he spent 16 years as an engineer in the Space and Guided-Missile Division of Messerschmitt-Bólkow-Blohm GmbH. He received his doctorate in aeronautics in 1965 from Technische Hochschule Darmstadt. CHRISTOPH GLOCKER, Dr.-Ing., received his degree from Technische Universität München in 1995. He is currently involved in postdoctoral studies. Dynamics of Rigid Body Systems. Frictionless Impacts by Newton's Law. Impacts with Friction by Poisson's Law. The Corner Law of Contact Dynamics. Applications with Discontinuous Force Laws. Applications with Classical Impact Theory. Applications with Coulomb's Friction Law. Applications with Impacts and Friction.